Free books, Real Food for Rookies class, newsletter, and other free member benefits here! Learn what to buy at the store and what NEVER to buy -- clear advice delivered immediately to your inbox so food shopping will be faster and easier! “Yours are the only emails I won't unsubscribe from.” — Janice K.
I hear that a lot and want to help you too. It's a crazy world and we're all busy, I'll help you find the answers you need to raise healthy kids, feed them delicious recipes, and feel great yourself too, all while maintaining your sanity. 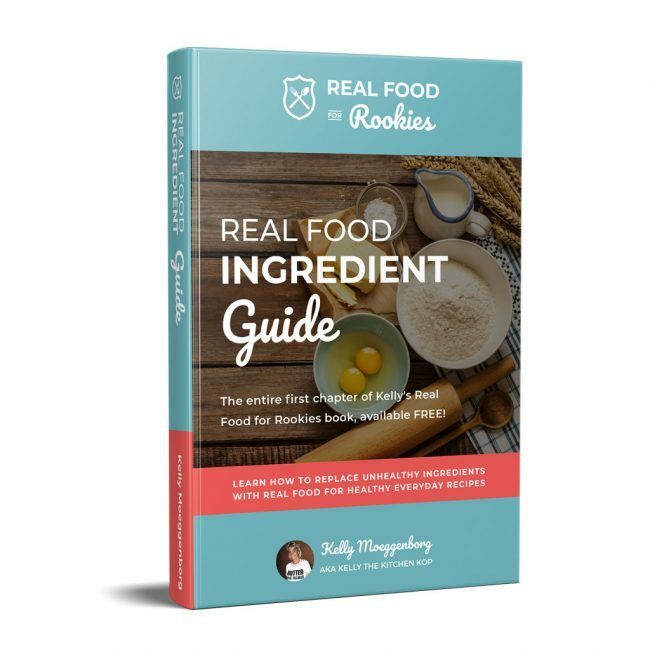 An Entire Online Real Food for Rookies CLASS! Now available free to all Krew members: Exclusive access to the Real Food for Rookies CLASS! Click here to read more about what you'll get in the Rookie class. Hint: There are video cooking lessons, audio interviews with real foodie/natural health rock stars, and lots more help to get you on your way. You can go through it all on your own time-table. As a Krew member, you'll receive personal replies to your email questions about real food or health struggles you may be dealing with and I’ll help as best I can (that's the whole reason I'm here!) or I'll connect you to more information — I have a big community of friends in the natural health world who know a LOT. …If you need more help beyond a brief email reply. Homemade FAST Meal Ideas — for busy nights or those times when everyone is hungry and you forgot to start supper! How to Get Rid of Head Lice Naturally — everything I learned when we went through it. How to Nontoxically Eliminate Bed Bugs — including DIY instructions for how to make an inexpensive bug trap. Top 25 Simple Ways to Boost Your Health with Apple Cider Vinegar — you won't believe all of these. Get all these resources FREE, now! Time for Another Amazon Gift Card Giveaway! Ready for a NOURISHING RESTART?